I had definitely seen that coming. I briefly toy with the “it’s one of those” answer and continuing on our way. Part of me is anticipating the usual ‘kids not in school today?’ comment from someone if we stop. But I do stop and we look at them. “What do you think it looks like?” I ask. “A melon?” E suggested. “A grapefruit!” A asserted. I’d seen that coming too. General excited agreement, and on we go to the library. At the library, A and M install themselves in the children’s area as usual, while I take E off to the computers. This is definitely her project and the others let her take the lead. I’m pretty sure there’s no point looking for books on unusual citrus fruit – even if we could order one, this is the kind of education requiring immediate results. So E types ‘P O M E L O’ slowly into a search engine. We discuss search engines and how they work. We find this video at the top of the results, and watch it (without sound). 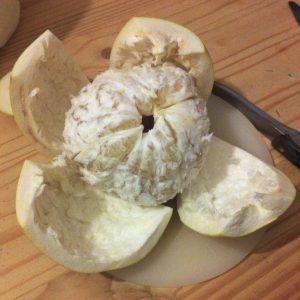 The search engine gods have smiled on us and we now feel fully informed as to how one approaches the eating of a pomelo. 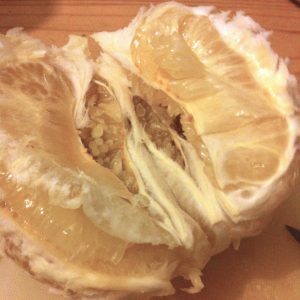 We find an article that suggests that pomelos taste like a mild, sweet grapefruit, which reassures me, because I know E doesn’t like grapefruit even if she has temporarily forgotten. So, on our way back through the market, we stop and bag ourselves a pomelo. Now I’m not and never have been one for impulse purchases. Indeed I have a pathological fear of impulse buying. 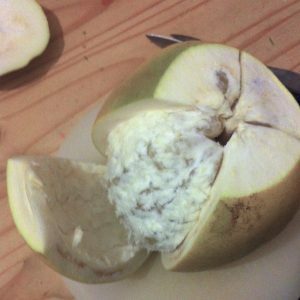 But I had earmarked around the same amount of money for a bunround from the baker’s stall, and everyone agreed they’d rather get a pomelo. Further, if the bunround itself seems extravagant, it’s because I view it as more than food. 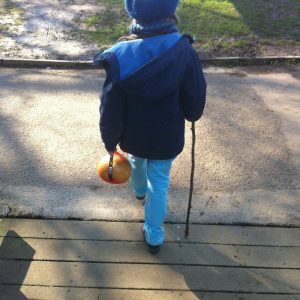 Giving the children the opportunity to interact with shop keepers and stall holders is worth the extra pennies over just adding things to our weekly supermarket delivery, because it’s teaching them confidence and interpersonal skills. I don’t want them to be nervous every time they have to speak to a shop keeper or stall holder, the way I am. 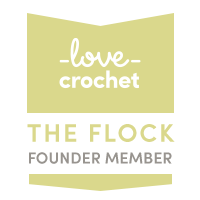 Many of you may have no idea why anyone would feel nervous doing that, but maybe some of you can empathise. Anyway, I’m hoping these simple interactions will give the kiddies confidence for life. Not M, she’s got plenty of confidence already. E is very proud of herself for being the one to spot the pomelo in the first place and find out about them, now I encourage her to hand over the money. I set A to calculating the change. M is in charge of the shopping trolley with all the library books in it. 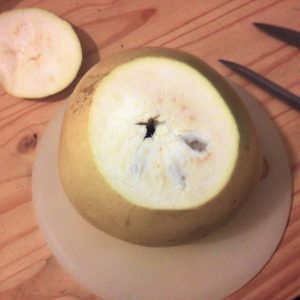 And home we go with a pomelo, which comes – to E’s even greater delight – with its own carrying handle. 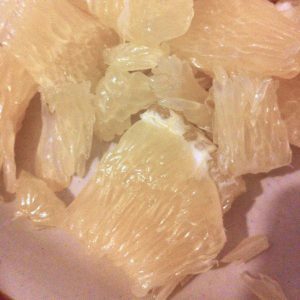 Teatime arrives and we proceed with the great pomelo dismemberment! E gives me instructions while I do the work, as per what she had learnt from the video. It takes a while! The smell is very strong, too – sweet, and rather like a mango, I think. Whilst this is going on: more research online. 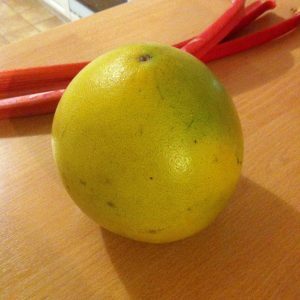 According to Wikipedia (other more accurate sources of information are available) the pomelo (Citrus maxima) is one of the four original citrus species, the others being citron, mandarin, and papeda. I think I was assuming it was itself some kind of cross between things – an unnecessary genetic folly – so I’m rather pleased to learn that. We look at where it came from on the globe – Southeast Asia. We contemplate all the stages involved in bringing our pomelo to us. The kiddies and Mr Conkers really like it. It is mild and sweet – it tastes less strong than its scent would indicate. It’s also crunchy, which I find rather off-putting. Mr Conkers reckons it’d be lovely from the fridge on a hot day. 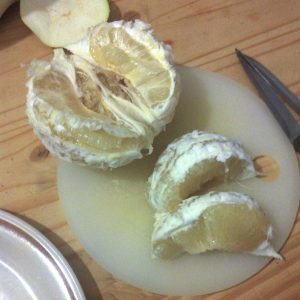 There’s a lot of it, even considering the pith is so thick – so we save half for the next day.